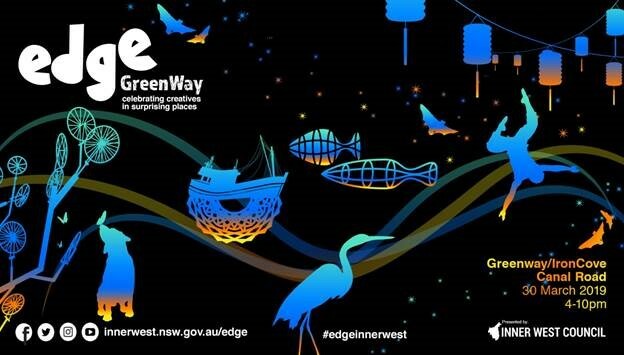 Inner West Council would like to invite Bike North to be part of EDGE GreenWay, on Saturday March 30, 3pm-9pm where the Bay Run crosses Lilyfield Pedestrian Bridge overlooking Iron Cove Bay. This immersive encounter brings together fans of sustainable transport, ecology, creativity and storytelling to celebrate the people and the place at the green heart of the Inner West. The bridge will host a ‘plane crash’ party with botanical mocktails and chilled DJs. The whole family is welcome to join in with a picnic blanket and can enjoy free kids activities, lantern-making, tours and talks, artists, musicians, installations and roving performers and entertainers. EDGE GreenWay culminates in a sunset finale with renowned local circus company Legs on the Wall, puppets, performers and a lantern parade leads us into Earth Hour. Due to safety concerns cyclists will not be able to cross the bridge between 3pm and 10pm and will be redirected around a short circuit of Hawthorne Canal. However, the council want to put us front and centre and acknowledge the activism of urban cyclists who have lobbied for active transport and who regularly use the GreenWay and Bay Run. Council will have a dedicated “Bike Zone” at the event, located in front of Blackmore Oval, right next to the Wetlands bar and Canal Road Film Centre. Do you have ideas to promote activities, cycling and community spirit. This could include bike workshops, guided bike rides, an art bike parade and bling-your bike contest, including prizes on offer. Inner West Council recognises the importance of the cycling community and its advocates in the ongoing creation of the GreenWay, and they are interested in discussing how Bike North can be involved in celebrating the bike community of the inner west at EDGE GreenWay.